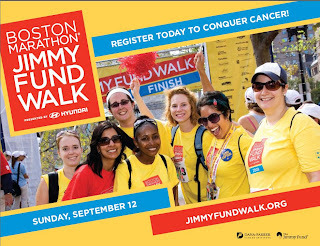 I am walking for the Boston Marathon Jimmy Fund Walk again this year. The past three years have been so much fun. And like the previous years, I am walking for my Mom. My Mom was diagnosed with stage 4 ovarian cancer in October, 2007. She had surgery to remove all but the inoperable tumor. Since then she has been through so many different drugs. Some make her hair fall out, some gives her peripheral neuropathy (numb hands and feet), some just make her tired. The drug she is currently on has cardiac symptoms. No one wants to mess with their heart. They carefully monitor her to see if she is able to continue on the drug. This is last year's poster, but don't we look awesome? This is why I do the Jimmy Fund Walk every year. To raise money for cancer research that might, hopefully, save my Mom. We need your help too! My goal for this year is $500 and I am quite behind. Could you donate to my walk and to cancer research everywhere? Thank you everybody! You are my heroes.